I walked into the first tour company outside my hotel. I didn’t know what I wanted. I had plenty of money. I had only been in the country for a few days. I didn’t do my research yet. I was leaving in two days. I was just the customer they desire–no objections, slight sense of urgency, gullible and willing. My agent was a young man who had a nice face and he told me about the open plan bus schedule. I would get several stops along the way from Hanoi to HCMC (Ho Chi Minh City), and stay in each place as long as I wanted. It cost 50 US$. It sounded great. Then I got to Internet searching and found terrible reviews all over about this tour company and any tour company for that matter. I got real nervous, thought about eating the ticket and just waiting for tomorrow to take the train. I walked around aimlessly, ate pho, drank a few mango juices, bought a beautiful sandwich from Joma (don’t miss this place if you’re craving a decent sandwich, evidently they are all over the big cities of Vietnam), got some chocolate, stretched and waited for the bus with severe apprehension about both making it in one piece and possible leg cramps. The transit bus packed 17 people and luggage into a minivan built for 12. It was crazy; and then another guy hopped in the front seat. We were dropped off at a street corner and waited. Nobody else seemed nervous. Two German speaking girls assured me it would be fine. The giant bus arrived lit up in day-glo colors, clean and new. I got a great first impression. I jumped in front of the nice Israeli guy I was chatting to because, I wanted first choice of seats. I protested with the driver’s request to go to the back and picked the first row, window, upper bunk. There were three rows, each with two bunks. There was also a functioning toilet, but with shoes not allowed and an increasingly wet floor (as men and bumpy buses don’t equal good aim), this was an unfavorable combination. It wasn’t as comfortable as a bed, but I was prepared with kindle, Ipod, clothing layers, sandwich and small pillow. The bus hit minor bumps along the way, made cargo pit stops, honked occasionally, but we arrived on time and safe. There were three drivers who took turns driving (and sometimes while moving). They were reasonably polite and careful with baggage. They talked and texted endlessly. I slept a few restless hours, similar to airplane travel, where you wake up from a crazy nap dream to see that only seven minutes have elapsed. I finished a book, delighted in my choice of road snacks and arrived fairly happy and relaxed. I have two more night trains left, so we will see if they measure up to this one. Camel Travel Tours–Hanoi to Hue to Hoi An to Nha Trang to Da Lat or Mui Ne and finally to HCMC. This place is all about ambiance. 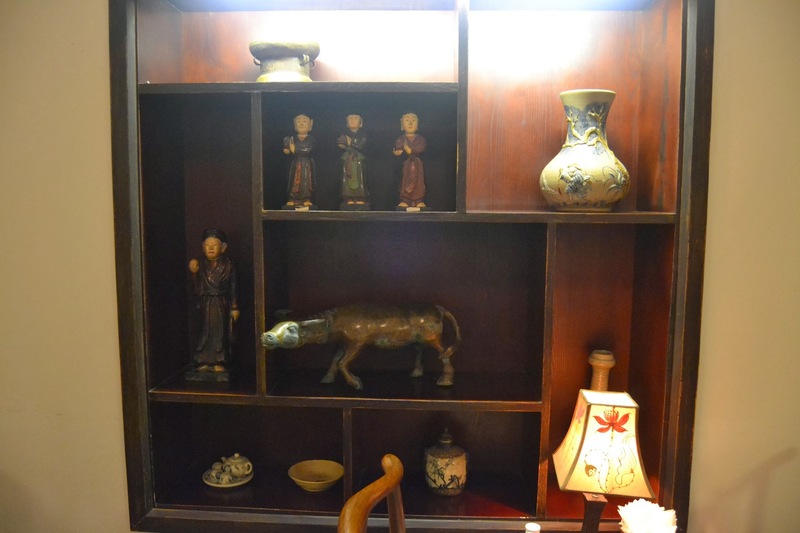 I loved the dark wood tables, the antiques scattered about the shelves and walls and of course the friendly owner, Hoa (Wha). She said I chose the best four items on her menu, which happened to be the same choices I’d made at several different local restaurants to see how the preparation varied. It is bun cha, the BBQ’d pork; cha ca, the dill flavored white fish; and Ha Noi style spring rolls. All were delicious and reasonably priced. The food wasn’t the standout here though, it is the vibe. It is quiet inside with attentive service. There are three floors, two balcony tables, and a large 20 person table. She also offers cooking lessons. I asked her about her place and she said she owns another one, 69 Restaurant, which is 11 years old, and this is her new baby at only three years. She’s dedicated to making money for her two children, as she works as teacher in the day, and entrepreneur at night. She said family is number one priority of life. Recommended for couples or large groups. In the heart of the city, bustling with traffic, littered with tourists, lined with expensive cafes, hotels and junk stores lies this calm puddle. The clouds never left and a steady mist fell all day. We loved it. My room was small but clean. The helpful and friendly hotel staff spoke English. The free breakfast included bacon, ham, eggs, fruit, vegetables, coffee and tea, essentially a very good start to the morning. The hot water was slightly sporadic. A train came by about 3 times a day, but not too noticeable. The location is good and wifi worked very well. It’s a great room for the price of 18US$. My arrival in Vietnam went as expected. The taxi drivers accosted us immediately offering rides for 20$, the humidity was palpable and the sky was overcast. We found our bus (which had seen better days) and paid 75 cents for two people for the long drive to Hanoi. The young toll collector on the bus closed my window when I tried to get some “fresh air”. He probably knew better than I did, that the dust was more clogging than the stale bus air. His socks were speckled with dots, and I thought, he’s just a bus fare collector, but he’s got on nice socks! Then I looked closer and they were mud or food stains. He was just a quick reminder to me that Vietnam is only 40 years out of the war, and that people here are still rebuilding. I remember thinking after we went over more potholes that jarringly rattled the windows, “Thank god they have that speed bump there, or else people could really be flying down these holey, unpaved streets.” The roadside was amazingly interesting. There were half-clothed children running, chickens fighting in cages, slow, smoky fires burning, all without apparent supervision, expansive landscapes of rice paddies being farmed by old ladies in knee high rubber boots and the classic pyramid hats. Buildings are very skinny, tall and usually equipped with columns and decorative stuccos or accoutrements. The people are all moving, both in a hurry and lazy like, as if they have nowhere to go, but they have to get there before you. Stores are selling everything. It’s hard to believe any country needs this much street commerce. Motorbikes became more ubiquitous as we got closer to Hanoi. It is apparent quite quickly that this is not Korea. Korea’s busy beehive seems so clean, efficient and organized compared to this overcrowded, messy, anarchic anthill. I was immediately struck by the architecture and how every building had a nice style, even if it was dilapidated. Korean post-war block architecture greatly lacks flavor (even though that is changing slowly). I love a long bus ride to acclimatize to a new city; and our two hour bumpiness gave me ample time to adjust. 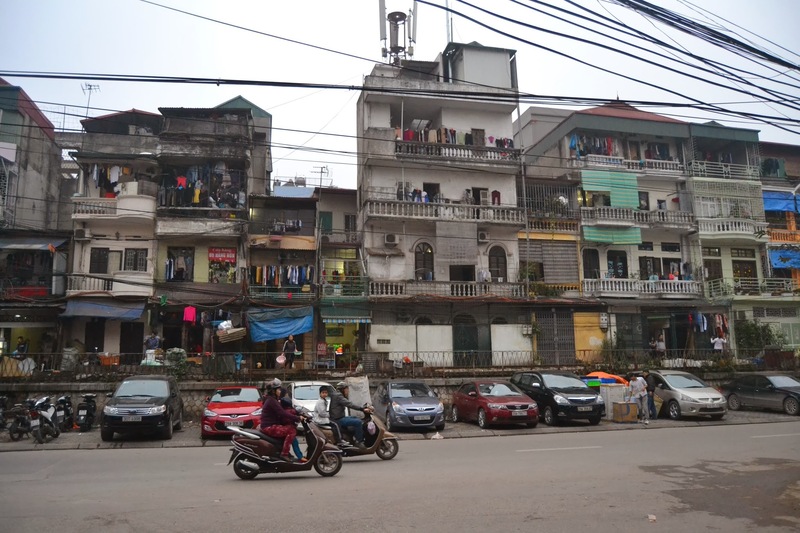 We got off at Long Bien station and weaved away from the pesky taxi drivers and asked some locals how to find our hotel. Eventually, the wildness and unpredictability of the traffic and our burdensome luggage prompted us into a cyclo ride. We did the math and realized with every pedal of his bike, he was pushing 250kg. He rode us at least 10 blocks for about 3$. Our room was at ready, small and clean. We were staying at The Landmark Hotel, (19 Nguyen Van To) a very reasonably priced and clean place. After a quick tea, the Vietnamese cuisine called us outside. 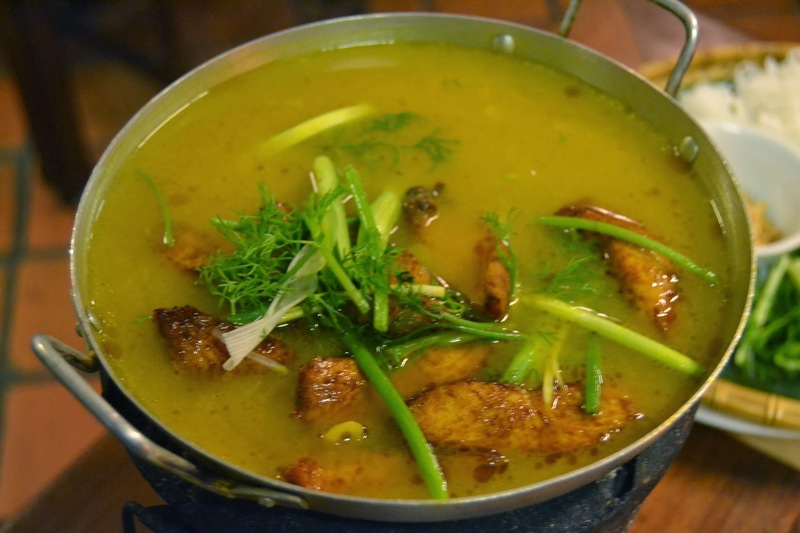 The famous local restaurant (Quan An Ngon) was outstanding and reasonably priced. 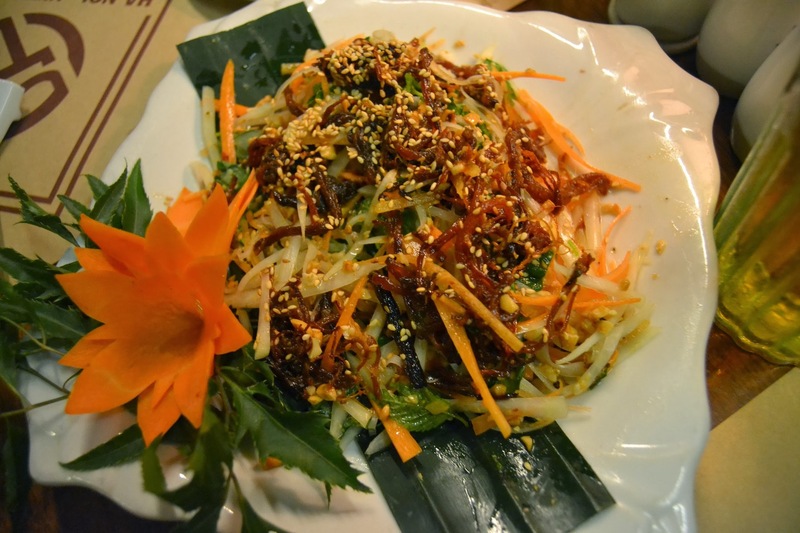 Assorted dishes with exotic names and familiar ingredients tickled our taste buds, and all washed down with Beer HaNoi. 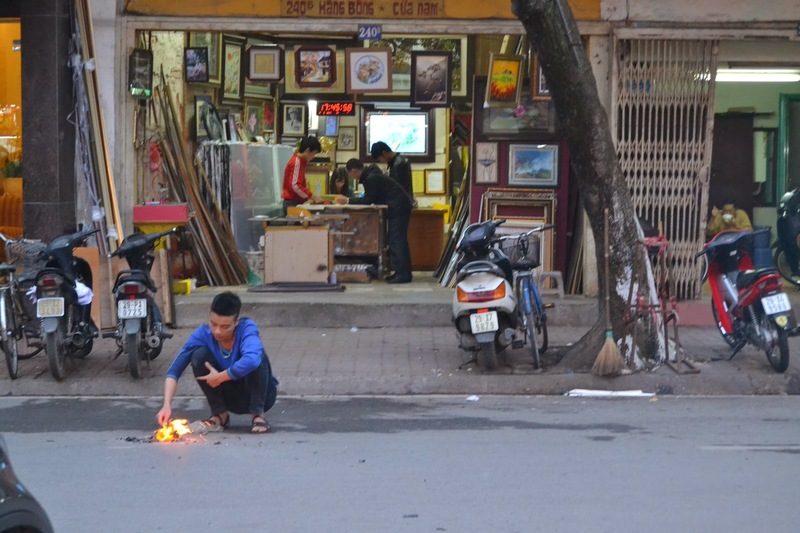 A wonderful first day finished with a slow walk down the dark and dirty, yet relaxed streets, cluttered with simmering pots and chatting Vietnamese. Random pictures of my walk from hotel to restaurant. Also, I’m pretty sure this guy on the bike is giving me the peace sign while driving through traffic with a fur coated lady on the back. The hotel worker recommended a place that was, according to my request, “excellent but not TOO expensive.” He knew exactly what I wanted and it was a great success. Jordyn and I had two amazing dinners there. All the plates are between 40-200 thousand dong. 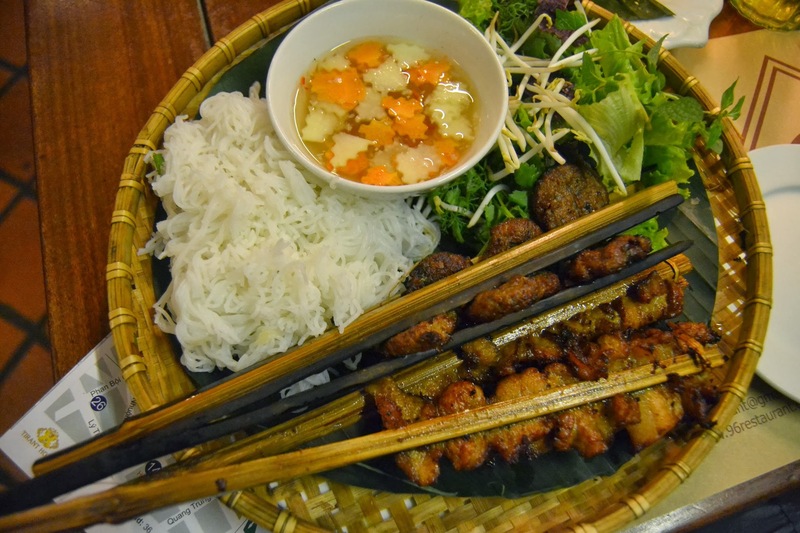 You can get any of the famous dishes of Vietnam as well as some new surprises. I ordered about two things off each section (except Pho, I’ll save that for later). 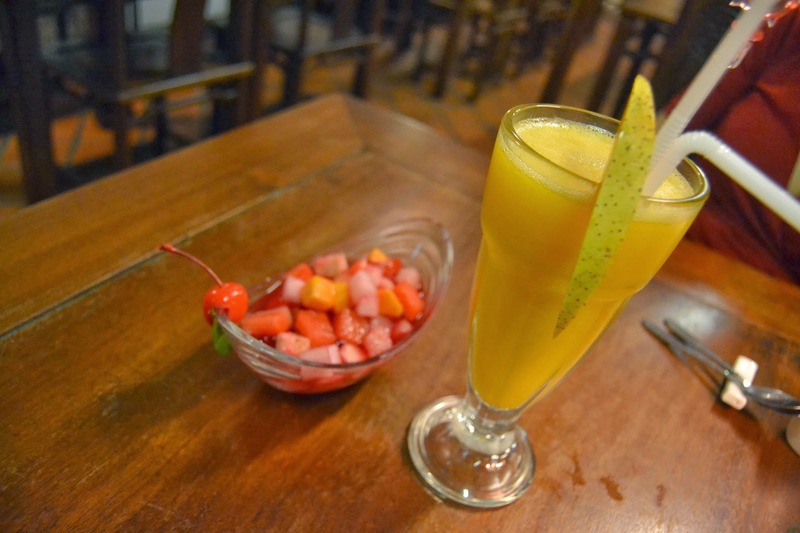 I think I remember ordering shrimp with lemongrass, Mi quang soup, crab samosas, beef boiled with green rice, pork and chicken skewers, some rice and of course lots of Hanoi beer. Everything was delicious, service was fast, and atmosphere is completely casual and contemporary. It was filled with faces from around the world, showing that it satisfies lots of differing palettes. I felt completely satisfied but not the “American full” where you are in pain from gorging. There is so much on the menu that I will have to make another stop here before I leave. 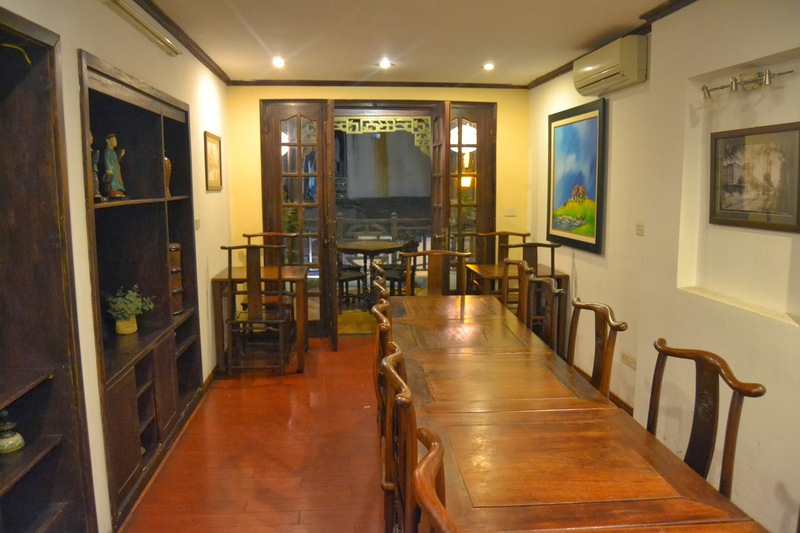 It is located in the Old Quarter at 18 Phan Boi Chau. These girls were shy at first and then when I got out the camera, they posed like naturals.